Are you a free spirit? Do you love the idea of being married barefoot in a wooded glen? If so, you are a bohemian bride! Learn to embrace your unique style and plan a wedding which suits you to a tee. The bohemian bride is not about country clubs, big bands, and wearing her mother's wedding gown. She is an earthy woman with an easy going nature who is happiest running barefoot through a field of wildflowers. 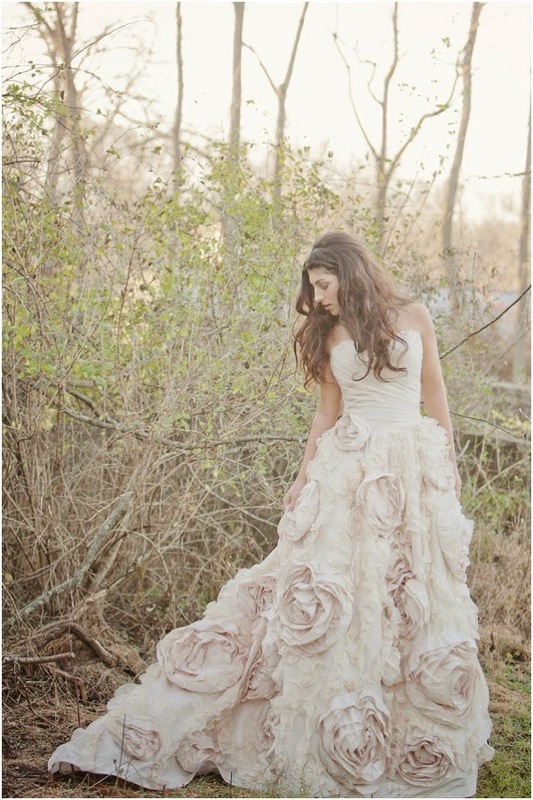 Think woodland spirit, chic hippie, or nature lover, rather than traditional bride. The bohemian bride will be happiest with an outdoor wedding, lots of pretty informal flowers, and of course, a unique wedding dress which shows off her eclectic style. First the wedding gown. Look for something ethereal, romantic, and unstructured. Avoid structured bodices, ball skirts, and sequins at all costs. An empire waist gown with a minimal train is ideal. Flowing fabrics such as chiffon and English net are the essence of bohemian chic. Embellishments such as subtle embroidery, fabric flowers, and overlays are gorgeous for an ethereal bride. Let your hair cascade over your shoulders in romantic waves, or pull it back into a loosely braided bun. A floral wreath and handcrafted bridal jewelry will finish your free spirited bridal ensemble perfectly. Feel free to choose bridal jewelry which is handcrafted in your favorite color, rather than traditional white. 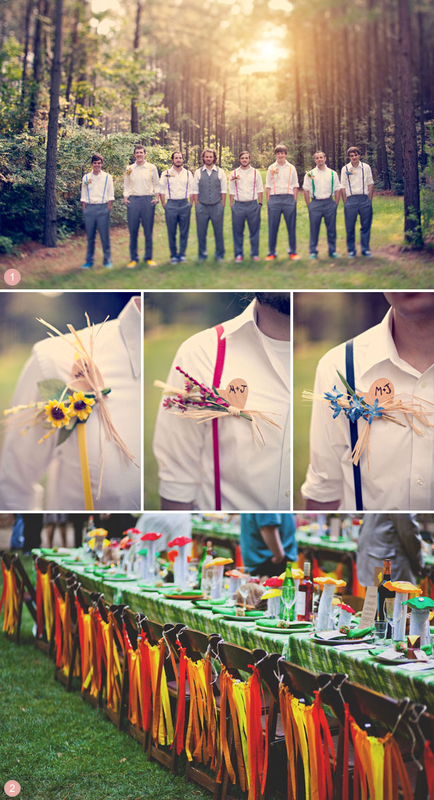 A bohemian wedding should have gorgeous floral accents which have been very loosely arranged. 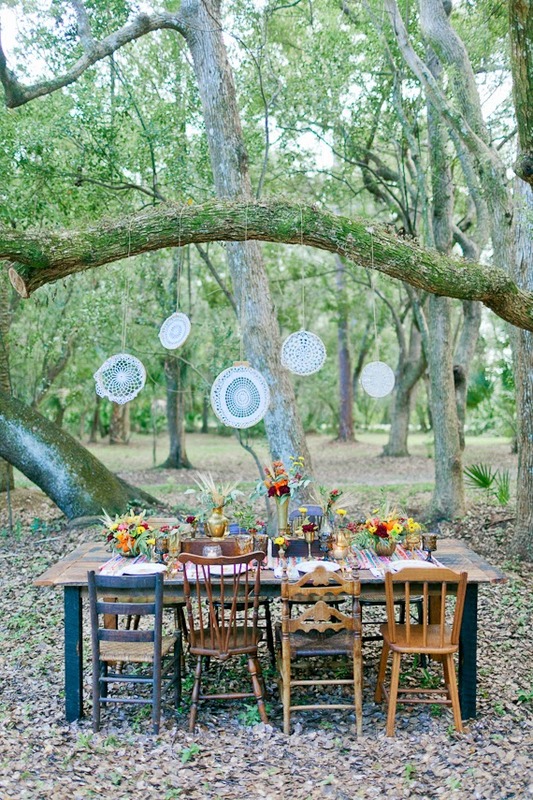 Pots of wildflowers on the tables, garlands strung among the trees, and a rustic branch ceremony arbor covered with flowers are all beautiful ideas. Take advantage of the natural scenery at your wedding site, and build upon it. If your wedding will take place in the autumn, for example, branches of leaves would be a nice addition to the tabletops. There are many natural elements which would be pretty to suspend from trees, such as white paper lanterns, grapevine balls, and twinkling white lights. A formal wedding cake may seem out of place at an earthy wedding. You might find that a selection of homemade wedding pies is a better dessert option, especially for a rustic wedding in the woods. If you have your heart set on a tiered wedding cake, think about a rich chocolate frosted cake rather than a traditional white one. Drag the frosting to give it a texture like tree bark. Fresh flowers make a nice decoration, or add a touch of whimsy, such as tiny marzipan mushrooms and ladybugs. They would make wonderful woodsy cake decorations, especially on a chocolate cake. When it comes to music for a bohemian woodsy sort of wedding, Lester Lanin's orchestra just will not strike the right note! Neither will a d.j. spinning the latest dance tunes, for that matter. More folksy, bluesy music will seem right at home in the woods, as would a harpist or a guitar player with a great singing voice. When you are a non-traditional bride, it gives you a lot of freedom to choose the things for your wedding that will make it feel very special and personal.